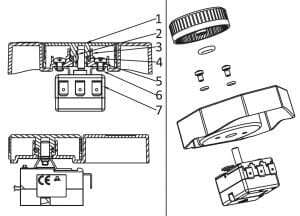 It is often necessary, when the devices include a system of adjustment or a reset, to be able to have access to it, without having to unscrew the lid of the box. 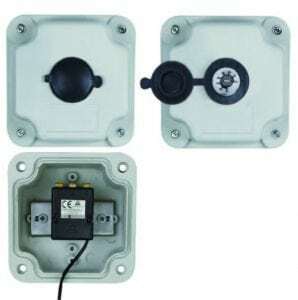 One solution is to use enclosures with an easily opening porthole or window, while protecting the user against electrical contact. This solution is possible for large enclosures. 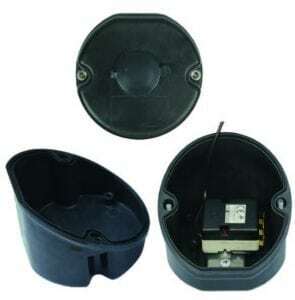 For small enclosures, special devices have been developed. The most common solution is a flexible silicone boot that is easy to open and close. These boots, whose mobile part is captive, simply install in a hole of 20mm. 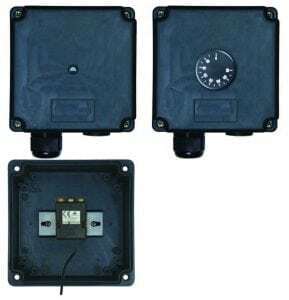 They can therefore be mounted on all enclosures. These boots, when closed, comply with an IP66 ingress protection degree, but are not adapted to the conditions of the IP69K. 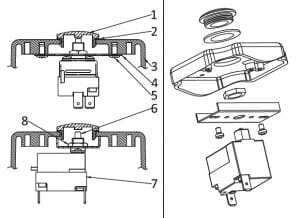 The mounting of internal components such as adjustable or manual reset thermostats, potentiometers etc., can be done either with a back plate screwed inside on the cover (Most aluminum and stainless steel enclosures, and a large part of the plastic ones have bosses for this purpose), or by direct mounting on the bottom of the enclosure. 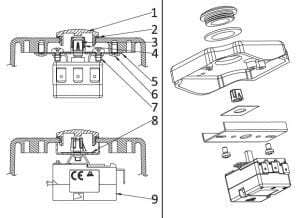 Although less common, it is also possible, on the enclosures whose wall thickness allows it (It must be at least 3mm, which eliminates the stamped metal cases), to make a threaded hole and to install a M20 cable gland cap equipped with a gasket. 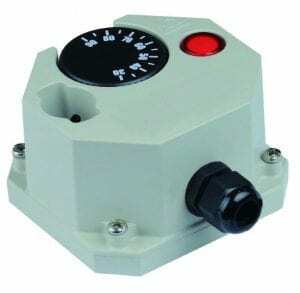 This solution may be required by the standards, when adjustment or reset can only be done using a tool. With this solution, IP66 and IP69K ingress protection degrees are kept. 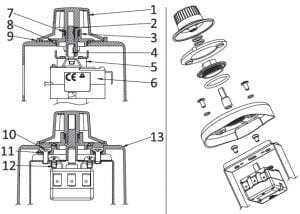 Adjustment by a shaft or button located outside the housing is the one that offers the lowest guarantee of resistance to water and dust ingress and shock. It is acceptable only when IP54 degree of protection or less are sufficient. 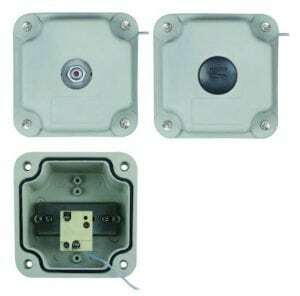 In the case of adjustment by a rotary shaft, it is necessary to insert a special gasket on the shaft, sandwiched between the back plate and the cover of the enclosure. 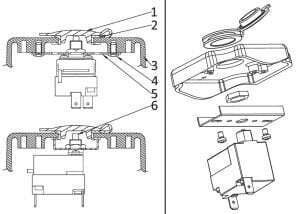 Direct mounting without back plate does not allow for proper sealing, as water and dust can penetrate through the adjustment shaft and mounting screws. 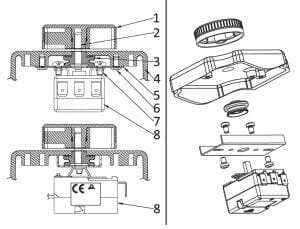 In the case of access to a manual reset button, it is essential that the protective cap of this manual reset is present, and is equipped with a seal. The main risk is then the loss of this seal and protective cap. This adjustment by a knob located outside the housing offers a very good guarantee of resistance to water and dust ingress, but limited impact resistance. This type of external control by means of a waterproof and shock-resistant knob has been developed for all industrial, commercial and food industry applications, as well as on transport vehicles, for which high-pressure hot water jet cleaning is essential. 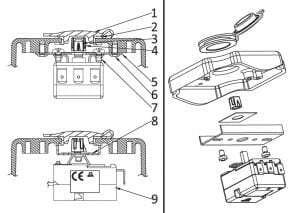 It allows the setting of a mechanical or electronic thermostat while maintaining its sealing characteristics. 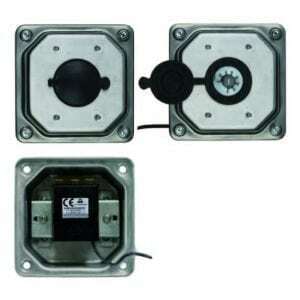 The embedding of the control knob provides excellent impact resistance. It also allows access to the adjustment accessible from the front and the upper sides. However, this solution which comprises an O-ring between the central core of the handle and the housing is only feasible on a limited number of molded boxes, and imposes a knob diameter of 50mm minimum.